Sometimes necessity is actually the mother of invention, or at least the impetus for new recipes. 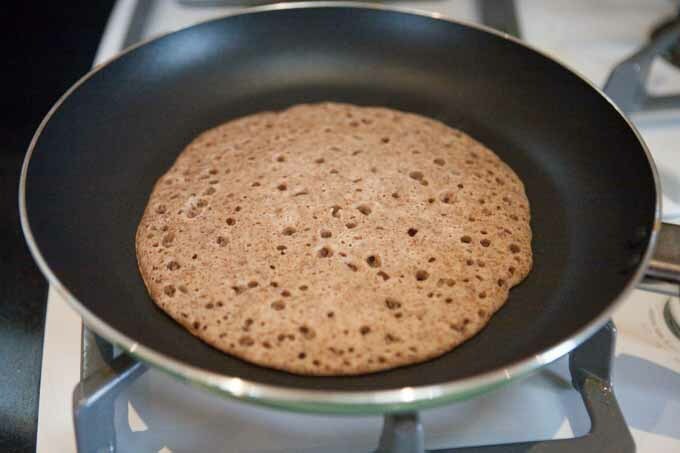 I was out of rice and had a hankering for some dosa so I mixed up a batch using red quinoa (prounounced kēn-ˌwä or kē-ˈnō-ə) and red lentils and it came out beautiful and delicious. For those of you not familiar with dosa, this recipe is for making a fermented batter which when cooked becomes an Indian crepe/pancake. It is commonly made with seeds, in this case rice and lentils, which are soaked, blended and then fermented. 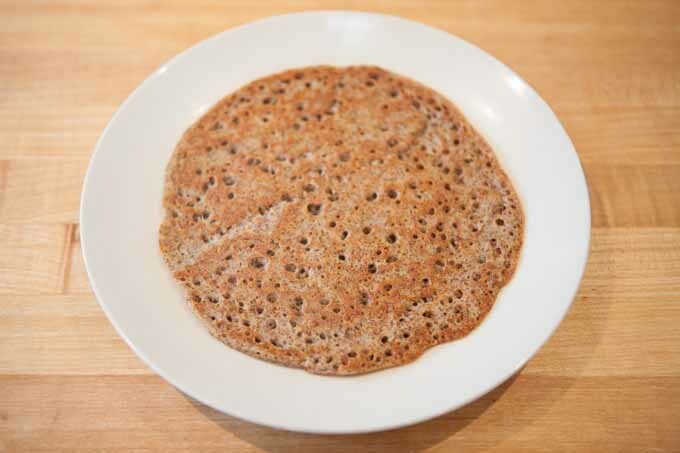 You can find my non-quinoa dosa recipe here. As protein rich as rice can be, quinoa is a more protein intensive seed than the brown rice I am substituting for here. 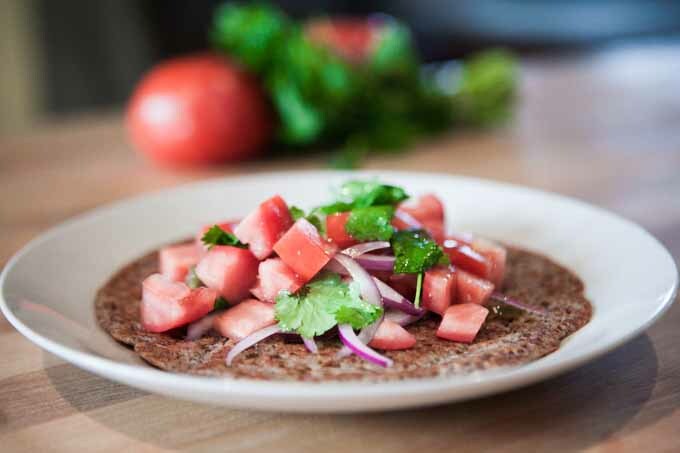 Lentils by the way have 50 grams of protein per raw cup so quinoa dosa becomes a very nice way for vegetarians to get a good serving of protein. Pour into a bowl and set on the counter uncovered for 1-2 days. 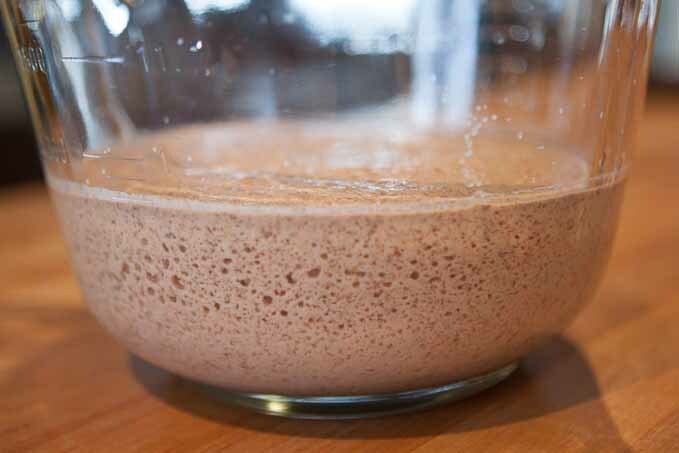 You’ll see bubbles forming and the batter will puff up and as the fermentation progresses. The scent will gradually become more and more sour. Prior to cooking, stir the batter with a spoon until smooth and creamy. Heat a skillet (if not non-stick, perhaps add the slightest bit of oil spread evenly). 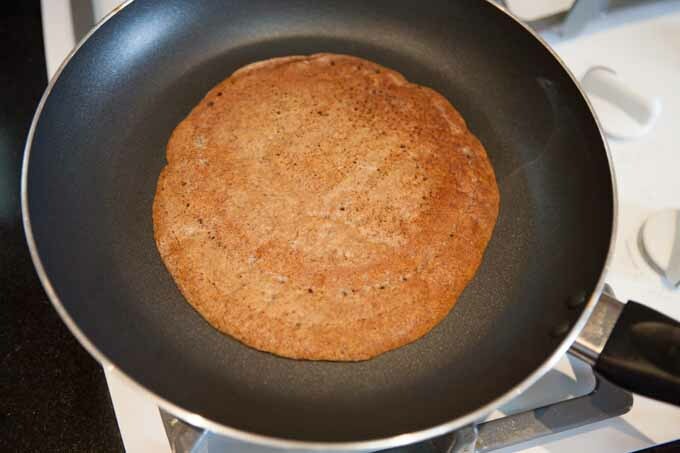 Pour 3/4 cup of batter into the pan and tilt the pan in a circle to spread the batter more widely and evenly. Cook on medium flame. 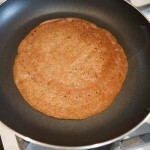 I like to leave my dosa fairly thick and substantial like a traditional American-style breakfast pancake, but the tradition in South India is to make a thinner batter and to use a ladle to spread it thinly in the pan and cook it as a crispy crepe which makes it easier to place a filling inside and use as a wrap. 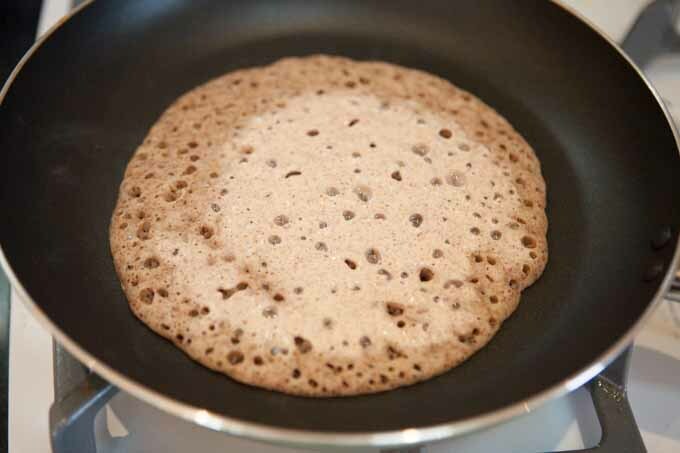 Once the top of the dosa appears as cooked through (no longer the consistency of batter), flip it over and cook for another minute or 2. Stir the batter each time before using until creamy smooth. looks like this once cooked. Ready for toppings! There are many ways to serve dosa. To get kids to eat them, you can cook them in a waffle iron if you like and top with fruit and yoghurt. I like to top with coconut oil and fresh fruit when eating for breakfast or with almond butter, avocado and curtido or sauerkraut for lunch. For dinners, I simply place the cooked dosa on a plate and top with a spicy stir fry. A spicy vegetable masala tops it off nicely as well. This looks great! I would expect that the volume would expand with fermenting, how many dosas will this make? 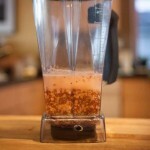 I have reviewed many recipes for fermenting on your site and others. Is starter culture necessary, or can this be replaced with salt? And if so, what would be the ratios? I have also heard of using probiotic capsules to start the fermentation process. Your thoughts on this will be greatly appreciated. Thanks! Hi Alan, thanks for comment. 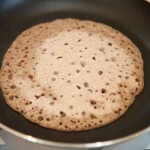 I use about 3/4 cup batter per dosa. This recipe makes 6 of those dosas. No starter culture is necessary. To date, I haven’t found the need to add starter cultures to my ferments (except kombucha). I have a trust that the microorganisms naturally found on the items which we ferment are perhaps the best choice for the fermentation process. I may not always understand nature’s wisdom, but it certainly seems to be present. Take you pick of lentils. I’m sure they will all work fine. Mung beans can be used as well. enjoy! Does the grilling of the batter kill the microorganisms? How long can you kepp the batter and would you refrigerate? Yes Patty, I’m sure the grilling of the batter very likely kills most if not all of the microorganisms. Depends of course on how completely you cook the batter. 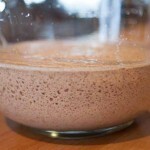 The fermentation process, in this case, is more about creating a useful batter from the grains and also adding flavor. I have found that the batter doesn’t keep all that well. Seems like if not eaten within 2-3 days, refrigerated or not, that the batter gets a bit exhausted and no longer makes as nice of a dosa. You’ll need more liquid then. After soaking, there is usually plenty of liquid, but I’ll generally have an inch or so of liquid on top of the grains in my blender before blending. The amount of liquid required is an inexact science: the more watery the batter, the thinner the crepe. Personally, I like mine a little bulkier so perhaps I err on the side of less liquid. This is very interesting. I’ve known dosa to be made with black lentils (urad dal). I had no clue that you could make it using red lentils as well. I find that quinoa aids fermentation of idli and dosa batter in colder climes. Would you know if there is any basis for my observation? I’ve started making these today. I’m thinking if I soak the Lentils separately, for longer (8-12 hrs) to initiate sprouting process, might that yield a higher protein content ( – while still soaking the quinoa the 4-6 hours)? I get that cooking the dosas kill the organisms, but being vegetarian, a high protein yield interests me. Hi Renee, I’m honestly not an expert on proteins and the effects of sprouting, but I have read that some of the fats and carbs of legumes are converted to protein during sprouting, and also that some amino acids are created. In and of itself, this is a high protein dish, but my sense is that sprouting is generally a beneficial thing to do and would likely make sense here too. Good luck! So I made these with TJoe’s Tricolor organic quinoa and a mix of organic blue, red, and green lentils. 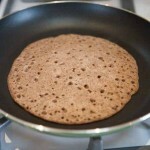 I soaked a lentils a few hrs longer, but then got impatient..Made first 2 dosas after 24 hrs’ batter sitting. Definitely were better after 2nd day ferment. And there were more dosas than we could eat, so I wrapped in parchment then froze in freezer bags. I must say the flavor seemed improved when reheated with tahini and apricot spread! 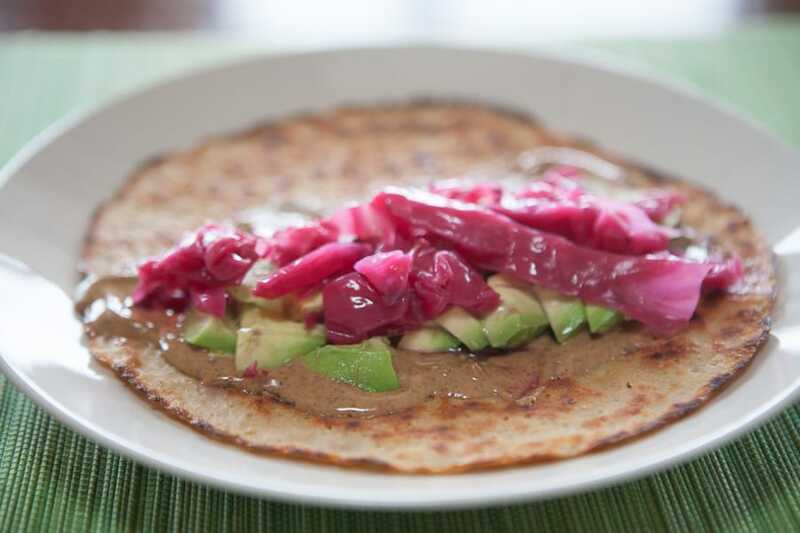 When I get a dehydrator, I want to try this recipe again. 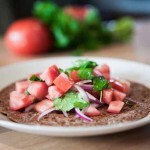 This is a great healthful substitute for bread lovers. Thanks! 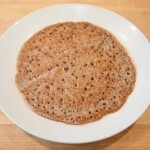 I love dosas and have made some nontraditional combos like red rice and red beans, millet and lentils, sorghum and chickpeas, buckwheat and black beans, you get the idea, whatever grain and legume combo you have on hand, in about equal portions, soaked and ground as you directed, and then fermented until it’s bubbly! Fun! You mentioned tempeh, which I am very eager to make, where are you getting the spores from? I need a trustworthy cheap source! I bought mine through Amazon (http://amzn.to/2lWsD4J), it’s from a company called Cultures for Health. Amazon has another one as well, coats most but has significantly more starter. I’m pretty sure there should be a way of propagating your own starter for future use when you make a batch of tempeh, but haven’t tried that yet. I’m sure I will and will eventually share that. Good luck. Thanks for all the tips on different makeup of dosas. I tried a rice and pinto bean one early in my dosa making days and it stunk pretty bad which turned me off from trying too many other beans. I’ll try again for sure now. Thanks for sharing your ideas. Should you soak the quinoa prior to soaking? And should you discard the soaking water? I did not wash the quinoa and blended with the soaking water. The quinoa you get at the store is prerinsed. It must be because quinoa has natural saponins (read soap) on its hull that has to be removed to be at all palatable. I harvested my own quinoa for the first time last year at it was amazing how bubbly the rinse water got, like I had added dish soap to it. It took many many rinses to remove.